Let’s cut to the chase: the CMA exam essays can be tricky. Not because they involve writing, but because you have to take certain steps to score well on them no matter how skilled a writer you are. 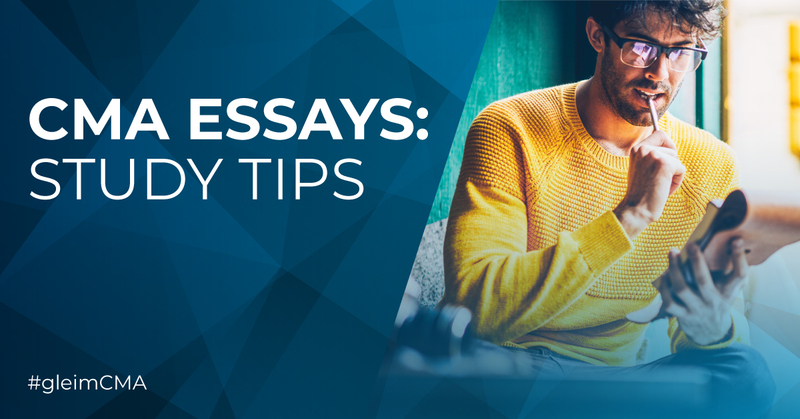 Facing the essays is an inevitable part of passing the CMA exam, so you must master them during your studies by following these seven essential CMA essay study tips. Once you review them, learn even more about acing the CMA exam essays by watching this informative webinar. As the first CMA review provider, Gleim has been helping candidates pass the exam for nearly 40 years, so we know what you must do to succeed on the essays. Here are seven tips to help you maximize your score on the essay portion of the CMA exam. 1. Know the essay structure. Familiarizing yourself with the structure of the essays is essential to establishing your exam day expectations so you can remain calm and confident. Both parts of the CMA exam contain two essay scenarios. Each scenario describes a typical business situation and asks two to seven written response or calculation questions based on the situation. The exam only presents you with the essays if you have answered at least 50% of the multiple-choice questions (MCQs) correctly. If you have done that, the exam will move you into the essay section once you have answered all 100 multiple-choice questions (MCQs) or three hours have passed, whichever comes first. You have a minimum of one hour to respond to the essay scenarios, but if you finish the MCQs in less than three hours, your remaining exam time carries over to the essays. 2. Learn the CMA exam content. This tip isn’t surprising, but it’s still worth mentioning. The CMA exam only has two types of questions (multiple-choice and essay), and even though these question types are quite distinct, each evaluates you for the same set of skills and knowledge with the exam content. Justify a selected course of action. Each of these abilities requires you to interact with management accounting and financial management information as though you were a CMA in the field. Therefore, the time you put into learning the exam content prepares you for both the MCQs and the essays. If you’re unfamiliar with some areas of the exam content, taking the time to read the books or watch the lectures won’t detract from your practice with the exam questions, but rather, will enhance it. a) Use of standard English – response includes proper grammar, punctuation, and spelling. b) Organization – response is arranged logically and coherently. c) Clarity – analysis is clearly communicated with well-constructed sentences and appropriate vocabulary. The CMA essays are worth 25% of your total exam score, so preparing for them is critical for exam success. But here’s some good news: practicing for the essays doesn’t take much longer than practicing for the MCQs. When you hear the word “essay,” you might imagine pages and pages of text, but that’s not the case with CMA essays. Instead, you can respond to the essay questions with short statements or bulleted lists. When answering a computational question, you don’t even have to use sentences at all. You can just show your calculations and make sure to clearly state what the answer is. Our recommended amount of study time for each CMA exam part (120 hours for Part 1 and 100 hours for Part 2) includes essay practice, so taking this step doesn’t mean you have to study forever and is definitely worth your time. 5. Answer the easiest questions first. If you’re studying with an exam-emulating CMA review course, you’ll be able to navigate through the questions in a practice essay scenario just like you can on the real exam. You don’t have to address the essay questions in numerical order; you can navigate to all of the questions and decide the order in which you want to answer them. Because of this freedom, we recommend answering the simplest and most straightforward questions first. By doing so, you can secure some easy points and let your mind warm up for the more involved questions. This strategy helps you feel confident in your essay performance, but don’t let it cause you to leave a question blank. Double-check that you’ve answered every question by clicking through all of them before exiting the scenario. 6. Maximize points with the best question-answering techniques. Earning more points on each essay question increases your likelihood of CMA exam success. Make maximizing essay points routine by applying these best CMA essay answering techniques to your practice essay questions. Read the question carefully to determine the requirements for the answer. The correct answer to an essay question may include multiple components. You can’t receive full credit unless you present all of the required components, so keep track of what a complete answer requires and don’t forget to address everything the question is asking. But remember, even if you don’t know all of the components for which the question asks, you can receive partial credit for what you do know, so be sure to include all of the information you have on that topic. This step will help you maximize the points you can receive for each question. Make sure your solution answers the question being asked. As you write, you must stay on track toward meeting the requirements of the question. If your answer starts to focus too much on a topic outside the realm of the question requirements, you’re no longer earning points. You can say more about topics related to the question requirements than asked, but you shouldn’t waste your time writing about unrelated topics because you won’t get credit for this information. Show as much of your work as possible in your essay solution. You can receive partial credit for any part of your CMA essay response that is correct, so including all of your work allows graders to follow your analysis and assign all the points you deserve. Even if the final part of your answer is wrong, you can still receive the majority of the credit for that question if the majority of your work was right. Additionally, the graders will not penalize you for a mistake more than once, even if the result of that mistake appears throughout your response to the question. For example, you will not be penalized for flow-through errors (where you incorrectly calculate a number and then use that incorrect number in future calculations). Organize your reasoning so the graders can understand it easily. Don’t let valuable information get lost in a sloppy answer. Arrange your responses neatly. When creating a table, use the space bar to separate the columns, and label all the columns and rows. Spread out your supporting calculations so graders can see and follow them effortlessly. Present every part of your answer as best you can, but focus more on getting the question right than perfecting the formatting in the time you have. Go above and beyond the question requirements when time allows. You are not penalized for writing more about the answer to a question than specifically required; on the contrary, providing extra information when you can increases the likelihood of you receiving full credit for that question. But don’t expound upon one answer at the cost of getting to another. Only add extra details if you have time. Quickly proofread your responses to verify that they make sense. As you may recall, the exam employs the essay questions to test your ability to organize your writing. Keeping track of the flow of your work while you write can be tough, so step back and review your answer for coherency as a whole when you finish it. Again, you can write in either complete sentences or bullet points, so choose one and employ it consistently so your logic doesn’t suffer. After you’ve answered a question, carefully survey your response for any mistakes that would inhibit you from meeting the grading criteria, and use any extra time you have to confirm that your responses are clear, well-organized, and well-written. 7. Apply your CMA exam time management system. Even though the CMA exam doesn’t directly examine your time management skills, effective time management is a crucial component of a winning CMA exam performance. Therefore, you should practice managing your time while you answer practice essay questions. Establishing and sticking to a time management system is the best way to ensure that you answer every question on the exam. Since you may have more than an hour remaining to answer the essays (if you finish the MCQs early), we advise you to allot half of that time to each essay scenario. If you follow our time management system, which allots 1.5 minutes per MCQ, you should have 75 minutes remaining when you begin the essays. The goal is to make your time management system second nature by exam day, so follow it throughout your review. As you answer practice essays, give yourself about 30 minutes for each scenario. The mock exams in the Gleim CMA Review course give you 30 minutes to complete each essay scenario so you can practice with the minimal amount of testing time you will have. The exam timer will display the remaining testing time as hours:minutes:seconds, so get in the habit of thinking in that format and relying on the exam timer to track your time as you study. When you use these CMA essay study tips to prepare, you don’t have to be intimidated by the exam essays. You can develop even more confidence for exam day by preparing with the most widely used CMA review course, Gleim CMA Review. Our course is also the most comprehensive, as we cover every inch of the exam content and provide the largest test bank of MCQs and essay questions on the market. Each practice question is an opportunity to prepare for your exam, and with so many, you can be completely ready to pass. You can also find even more tips for mastering the CMA exam essays in our essay webinar. Access it for free today!